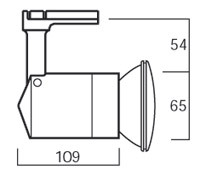 The Rocket range of stem spotlights accommodates PAR halogen lamps, as well as R60/R63 and R80 reflector lamps. PAR halogen lamps provide a similar quality of light and sparkle to low-voltage lamps but operate directly off the mains supply without the need for a transformer. 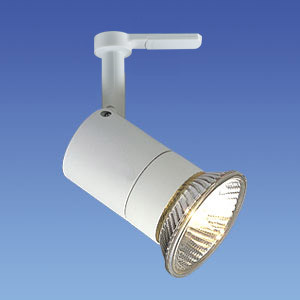 Rocket spotlights can be either track or surface mounted, and are ideal for highlighting and general lighting in retail, commercial and domestic applications. Accepts a variety of lamp types and wattages. Matching low-voltage Electrospot range offers design continuity. Can be made to order with a switched track adaptor for 1- and 2-circuit mains track. To order, add /S to the catalogue number e.g. T310-WH/S. Can also be made to order with a Global 3-circuit track adaptor. To order, add /G3 to the catalogue number e.g. T325-WH/G3. Pendant versions can be made to order in 500mm and 1000mm lengths. To order, insert a 'P' in the catalogue number and specify the length in brackets, e.g. TP325(500). To order 2-light or 3-light fittings, add /2 or /3 respectively to the catalogue number of the relevant surface version e.g. T425/2, T425/3 etc. Available in white or black.